Inflammations of the tonsils and pharynx are quite common. The most common causes are viruses and bacteria; however, allergic infections are also present. They are usually treated quickly and without any complications, although more serious complications are possible among certain patients, especially after suffering from purulent bacterial infections. Inflammations of the pharynx are most common among school children. Viral and bacterial infections are the most common. An acute purulent throat inflammation – tonsilitis − is most often caused by streptococcus. It begins suddenly, with a fever and a sore throat, a headache, difficulties swallowing and weakness. Enlarged lymph nodes can be felt on the neck. Purulent layers are visible on tonsils and palatal arches. Pharyngeal swab, microbiological testing and an antibiogram determine the targeted treatment - an antibiotic. 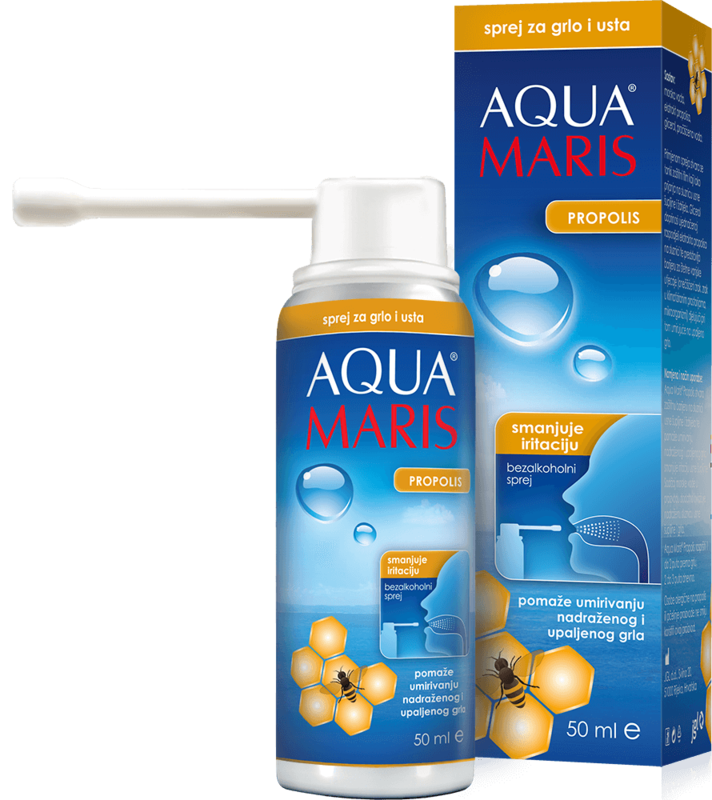 Apart from the antibiotic, a symptomatic treatment is also recommended: plenty of liquid intake (tea, water, juice, soup), resting and the Aqua Maris throat spray to clear the infection accumulation and to stimulate a faster regeneration of the mucus membrane. Lowering the body temperature is necessary if the fever exceeds 38°C. The whole course of antibiotics must be taken, even if improvements are felt very soon. If blood tests are conducted in case of a bacterial infection, an increased level of leukocytes and SE will be detected, as well as an increased CRP (infection marker). A viral throat inflammation is milder, and accompanied by nasal secretion, nasal congestion and scratching sensations in the throat. The throat and pharynx are red. In case of a viral inflammation symptomatic treatment is also recommended. In the next three to four days, the symptoms will become milder and subside without complications. Chronic tonsil and pharynx inflammation is a result of repeated acute inflammations. It can also be a result of smoking, working in a polluted environment, of excessive alcohol consumption, or chronic gastritis. The patient suffers from a burning sensation, irritable cough, hoarse throat, difficulties swallowing. The treatment is symptomatic and one must first remove the adverse effects from the environment (cigarette smoke, dust, chemicals, spicy and hot food, alcohol, etc.). Holyplant Septogal spray is recommended in cases of mild inflammation of the mouth and throat, and for the common cold. It has a positive effect on hoarseness. Used as a mouth refresher for bad breath and to maintain the normal state of the mouth and throat mucosa.